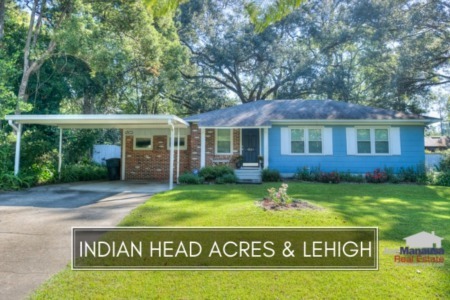 Indian Head Acres and Lehigh are two popular downtown Tallahassee neighborhoods which are off to a great start in 2016. Located on the south side of Apalachee Parkway east of Magnolia, they have excellent access to shopping, nightlife, Starbucks and the new Cascades Park Amphitheater. Homes in these two neighborhoods have been built from the 1940s to recent times, so this is one part of town where you really have to qualify the effective ag" of a home based upon is current level of renovation or modernization before you can determine its value. The following report includes graphs of average home prices, home values, and home sizes in Indian Head Acres and Lehigh, as well as all current listings in the Tallahassee MLS and all closed home sales in Indian Head Acres and Lehigh going back to 1991. It is important to note that the narrative contained below is for sales through December for all previous years, and through the third week of April in 2016. 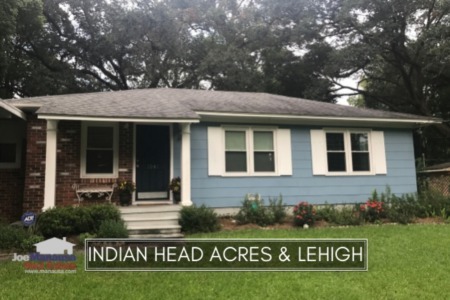 The graphs and the closed sales table will be continuously updated into the future (meaning bookmark this page if you always want to know the current status of homes in Indian Head Acres and Lehigh). Average home prices in Indian Head Acres and Lehigh are 14% lower this year than they were in 2015. This means that buyers are spending 36% less for a home than they were at the peak of the market in 2007. If the new mortgage forgiveness debt relief extension does not bring out new short sales, then I expect Lehigh and Indian Head Acres average home prices to begin to rise as fewer distressed properties will remain to be purchased. Home sales activity has been brisk thus far in 2016, and if the pace continues, it will be the best year on record for more than ten years. Home prices are low enough that it is likely to happen. Average home values in Indian Head Acres are down another 2% from values posted in 2015. The average value of a home sold in Indian Head Acres has been $91 per square foot. This is down 26% since the market peak was reached in 2007, and up only 11% since the bottom in 2012. This is a sign that the distressed properties continue to hold values back. The average home size sold in Indian Head Acres typically falls in a range of 1,300 to over 1,500 square feet, and buyer this year appear to be choosing the smallest homes available (after two years of the larger homes being the primary target). The 12 home sales in 2016 averaged 1,267 square feet. The following list contains more than 900 home sales in Indian Head Acres and Lehigh going back to 1991. I hope you enjoyed our April 2016 update on home sales in Indian Head Acres and Lehigh, please feel free to drop me a note if you have questions not covered in this report.